Welcome to Gerald Shea’s world—the world of the partially deaf. 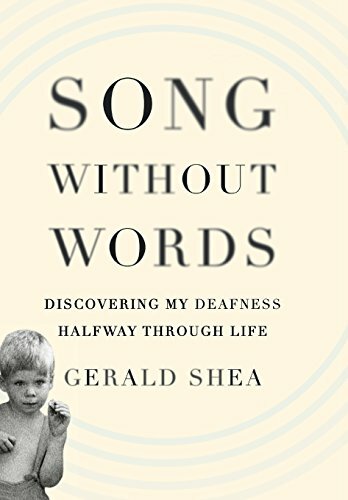 In his memoir Song Without Words international corporate attorney Mr. Shea flawlessly and candidly crafts his personal story while painlessly imparting a vast amount of information about the auditory system. Unbeknownst to him or anyone else, Mr. Shea lost most of his hearing at the age of six after a bout with scarlet fever and chicken pox. Believing that everyone interprets their aural world as he did, Mr. Shea refined his ability to translate verbal language riddles or what he calls “lyricals” into functional meaning. This starts a whole new round of lyrical interpretation. And so many of Mr. Shea’s meetings were spent consumed in the frustrating task of working out his lyricals, believing not that he was hard of hearing but simply that he wasn’t quite up to the riddling task that other people could do so well. Stubbornly determined to succeed as a lawyer over the course of three decades, Mr. Shea nearly kills himself, figuratively and literally, as he maintains a lifestyle that leads to the development of stomach ulcers, deep depression, and exhaustion, derailing a possible marriage to a woman he obviously loved dearly. “Leaning over the sink and pouring the medicine into a tablespoon, I looked at myself in the mirror, white and pale-green skin, red eyes circled in black—a faded flag of some occupied territory, twenty-eight years old and feeling eighty, and looking it, I thought. Song Without Words could easily have ended up as tediously frustrating as working out one of Mr. Shea’s lyricals—how much can one say about one’s life as a corporate lawyer,and how many examples of lyricals need to be read before reaching “enough already!”—but what saves this memoir is his unwavering command of the English language, his exceptional writing ability, and his extensive knowledge of the auditory system. What makes it shine is the sparkling of humor throughout, the addition of glimpses into his personal life, and the easing of what might be considered arrogance by tastefully illustrating his kindness and humility. You just can’t help but like this man. Song Without Words is one of those rare memoirs that once completed, you flip to the back cover hoping for an email address so that you might ask the author out to lunch. Mr. Shea, are you game?